a bit of history on theme thursday (tt) for those new to the mouse (with the b-o-n thingy, there have been plenty of new folks popping in for a nibble!). last spring a particular mouse and a squirrel got together and cooked up the idea of theme thursday. it wasn't long before mouse and squirrel's idea caught on with other friends in the cyberhood. tt was created to help prevent blogger burnout and at least once a week have a topic to post about - not to mention to have fun, be creative, and build community. anyone and everyone is welcome to play. if you have an idea for a tt, post a comment to mouse, squirrel, tut-tut, coffee, or megan - the official unofficial selection committee - ideas are posted on sunday for the upcoming week on most of these blogs (for all you curious cats, at the bottom of this post is a list of the themes we've done thus far). It takes a sour woman to make a good pickle. The kitchen is a country in which there are always discoveries to be made. We may live without poetry, music and art; We may live without conscience and live without heart; We may live without friends; we may live without books; But civilized man can not live without cooks. 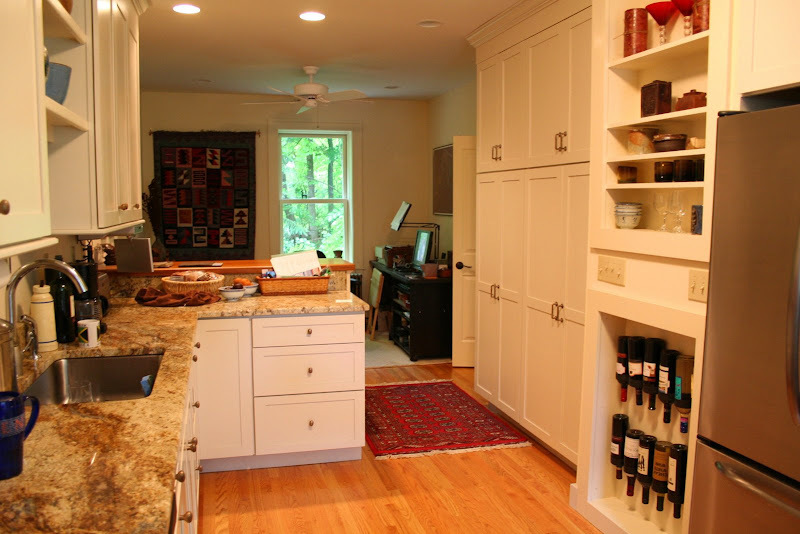 7. kay's dream kitchen, storrs, connecticut. mack the knife performed by pearl bailey and dinah shore around 1960 - kick back and enjoy yourself! theme thursdays so far: orange, bridges, amusement, transportation, shoes, birthday, home, door, water, steps, hair, wings, wheels, communication, keys, windows, trains, mailboxes, hands, baked goods, workspace, altars, books, leaves, spices, table, chairs, kitchen. Ah, Pearlie Mae! I haven't listened to her in a long time. It's a good thing I forgot about this week's Theme Thursday; any pictures of my kitchen would've had the health dept. over here on the hop! roy - you will notice I did not include any photos of my kitchen! Very nice what you've done here. Great photos. I love the pans but too many for our small kitchen. 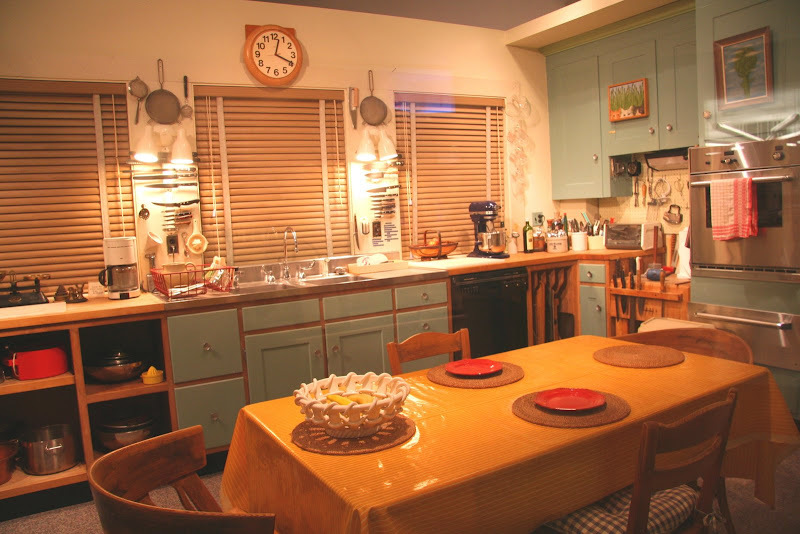 that's so cool they recreated Julia's kitchen--I love her! I love all the different moods those photos convey. My contribution comes from Brillat-Savarin: "La cuisine est le plus ancien des arts parce que Adam naquit à jeun." (Cooking is the most ancient of the arts, because Adam was born on an empty stomach." I made a post about Theme Thursday too, and I put a link list to all the other posts on it i found linked from Coffee Messiah's post. i'd feel right at home in kevin's kitchen. it has a lot of soul. Great photos for the day. Do so love looking at dream kitchens. My family could untidy that one in 50 seconds. Well, the dog in 5, but he's a pro. 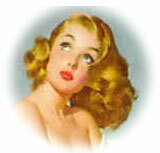 Thanks for the flashback to Pearlie Mae and Dinah...very witty:>). I wondered when they would start laughing?! Be hard to keep a straight face with the two of them. ok, now this is a the dose i needed, kimy! this post inspired me more than ever to get in that kitchen and cook cook cook! i'm still on the wagon : ) thanks! Dennis would take the organized kitchens that come with nice ladies cooking. I love Chabon. I've read everything of his that the library has. Great series of pictures today. I like that you included your mom and your aunt. I should link to the other players as well. I will do that next week! Well, well! After all that, I actually did manage to find some passable shots of my kitchen, so I actually made it to Theme Thursday! Who's a thunk it? and everyone always ends up in the kitchen at parties- it's a universal law, isn't it? comfort, sustenance.... great stuff! “1) Accept the award by posting it on your blog along with the name of the person that has granted the award and a link to his/her blog. Anyway, have really enjoyed this blog, & thought you outdid yourself today. Very cool as always and maybe one more person could squeeze into that one kitchen. Fabulous pics and quotes. And Dinah Shore! Wow, I forgot all about her. 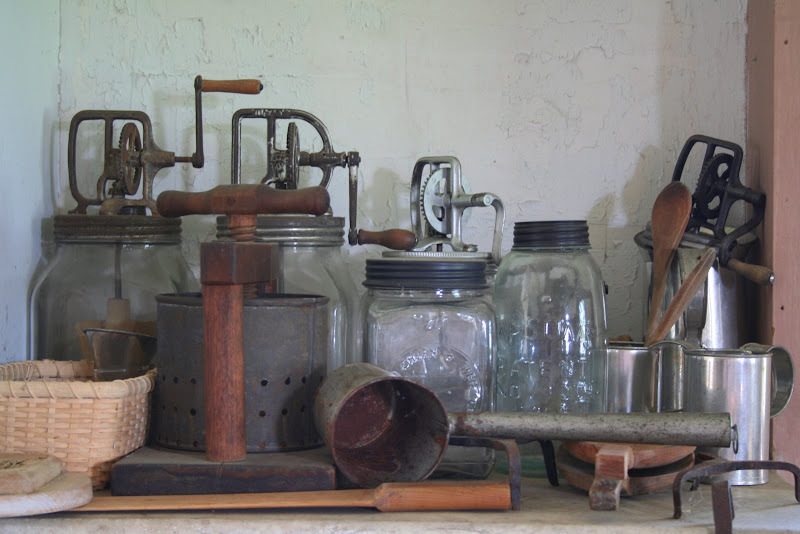 The first pic reminded me of some of my mother's kitchen gadgets - the meat grinder that latched onto the counter, the hand-held mixer, the electric beater and the first of the toaster ovens. I can relate to the messages and pictures posted. I love to cook. As I often tell my children, good food does not only come out with complete ingredients . . . one has to be in the mood and in love with the partakers of the meal served. candi - thanks for playing too! dd - since kevin lives in a house of one I think the pans are more an artistic display and celebration to cast iron, than functional objects - but they work for me! cathy - thanks! julia child is such an inspiration. that was the first time I was able to see the it since it was installed in washington. rlb - you won't find me messing with any bunny killers! revjr - thanks for playing along! avid - like his kitchen, kevin's has soul too! dennis - you would like those ladies too! roy- it's great to see the tt circle grow. your kitchen pics are wonderful. hope everyone will pop over to roy's world and check them out! marianne - it's funny - I found no matter how small my kitchens have been that it is still true - and I've had some really small kitchens. varun - thanks for the invite - unfortunately I've got my hands full for now. best to you and thanks for dropping by. great post kim. love the pics and the words. i am making bread today. I've read 3 books by Chabon. I enjoyed Wonder Boys the most. He's a good writer. This is great. I love those photos. What is it about a kitchen? Truly you can almost hear the "ba boom" heartbeat sound coming from this heart of the home! I used to think the bedroom was the most important room in the house. Now, the bedroom is still way up there (for obvious reasons), but the kitchen is at least just as important. Thanks for sharing those photos. Great kitchen photos. That's a good reminder for me to post some of my old ones.